Bulyamhulu Gold Mine (file photo). The plant is expected to be completed of the order is expected during the second quarter of 2022, and once fully operational the plant will have a capacity of 5,000 tonnes per day. "This greenfield plant will be utilising the most modern and energy-efficient equipment with the lowest possible environmental impact. I am also very pleased that with training and supervision included in the contract, we will help create 300 jobs in this region - as well as a source of cement for continuing regional development. This contract once again underlines our position as the preferred supplier of sustainable and productivity-enhancing solutions to the global cement industry," said Jan Kjaersgaard, President, Cement, FLSmidth. 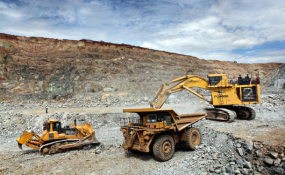 Ministry of Mines and Petroleum has approved the Mining Agreements for East Africa's 100% owned Mato Bula and Da Tambuk gold projects located in the Tigray National Regional State.